A haunting, beautiful little novel about grief, loneliness, and the solace we find in others. There are three parts to this tiny 160 page book, and 2 distinct stories. Usually I would call this a novella, but there is something about the narrative that, despite its word count, feels whole. It has the depth and character development of a much longer novel, which was a surprise to me. The first tale, which unfolds across Part 1 ‘Kitchen’ and Part 2 ‘Full Moon’ deals with the grief of Mikage after the death of her grandmother, and the family of mother and son who take her in. The story explores the nature of loneliness, the pain of grief, and the gentle healing of companionship. The second tale, which occupies the third part of the book is ‘Moonlight Shadow’. 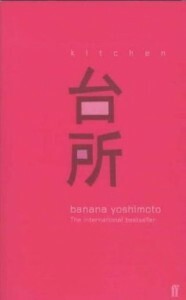 In just 40 pages Banana Yoshimoto explores teenage love, and once again, the different ways we each deal with grief. It is an achingly sad story about moving on, and though I preferred Miakge’s story this one was also lovely in its sadness. I really enjoyed Yoshimoto’s storytelling style, and the sparse translation gave it that quintessentially Japanese feel of implying so much with so few words. It would have been nice to see more of a conclusion to the first tale, or even a third part to that story, to really wrap us the direction that the growing relationship was heading. At the same time that I want a resolution I can see how the open ended nature of the narrative gives that sense of being an observer looking in on the lives of real people. Real lives don’t have neat edges and chapters. There really is so much to love about this tiny little volume. As Yoshimoto says in here preface ‘I know no greater happiness than that it might have cheered you, even a little.” Although the book is filled with sadness, grief, and loneliness, I was left feeling up lifted by reading it. Suitable for ages 16 and up, but probably of most interest and appeal to adult readers.